Mercedes-Benz on Tuesday revealed a redesigned Sprinter van and confirmed it for sale later this year, as a 2019 model. The design has trodden down a high-tech path, which Mercedes says will lead to simpler fleet controlling and optimized communications between fleet manager and driver. Key to this are new levels of connectivity plus new telematic systems grouped under the Mercedes PRO heading. The new systems that Mercedes PRO offers mostly mimic existing ones from the likes of Fleetmatics, Enterprise, Verizon, and others. While most offer real time in-van inventory monitoring and driver/manager communication, Mercedes PRO has the advantage of being more integrated with the workings of the van itself, specifically with the in-built MBUX infotainment system. The technology doesn’t end there, though. 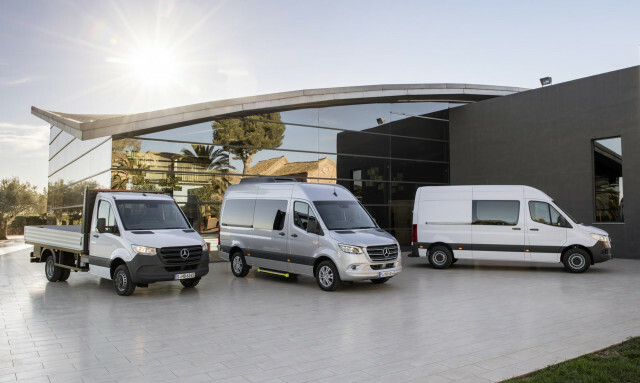 Numerous electronic driving aids are available, along with a fully electric model, the eSprinter, confirmed for a launch in 2019. Other powertrains include various gasoline and diesel units with outputs up to 187 horsepower, though these are dependant on the market. Drive is also to the front wheels for the first time though rear-wheel drive will also be offered, and buyers will be able to choose from either a 6-speed manual or 9-speed automatic. Externally, the design of the new Sprinter seems to follow the motif of 2016’s Vision Van concept. Overall, it’s a more streamlined and fluid appearance than the outgoing van’s frumpier looks. What buyers will be more interested in is space. With wheelbases of up to 170 inches (rear-wheel drive) or 154 inches (front-wheel drive), and a load compartment volume of almost 600 cubic feet plus a gross vehicle weight rating of over 12,000 pounds, the new Sprinter looks to be even more versatile than its predessscor. The other big news surrounding the Sprinter is Mercedes’ new Charleston, South Carolina assembly plant. Sprinters sold in the United States will be built at the all-new facility. Currently, due to the chicken tax, Mercedes assembles the Sprinter in Germany, then disassembles them for shipment to the U.S. where they are reassembled. Full specifications for the 2019 Sprinter in the U.S. will be announced close to the market launch later this year.